The number of stillbirths remains stubbornly high, a report says. The Confidential Enquiry into Maternal and Child Health (CEMACH) study blames factors such as obesity, social deprivation and mother's age. In 2006 the stillbirth rate in England, Wales and Northern Ireland was 5.3 per 1,000 total births, compared to 5.4 per 1,000 in 2000. However, the report found there has been a reduction in the number of babies dying in the month after birth. These neonatal deaths went from 3.9 per 1,000 live births in 2000 to 3.4 per 1,000 in 2006. The number of babies dying in the neonatal period from twin pregnancies has also fallen, from 22.3 per 1,000 births in 2000 to 19.3 per 1,000 births in 2006. The report also highlights the poor uptake of post-mortem examinations for stillbirths (38% in 2006 compared with 48% in 2000) as one key reason why the cause of so many stillbirths is still unknown. The research reveals that mothers under 20 and over 40 had the highest rates of stillbirth in 2006, at 5.6 per 1,000 births and 8.1 respectively. These age groups also had the highest rates of death in the perinatal period (immediately before birth and in the first seven days after birth period) and in the neonatal period. Of the women who had a stillbirth, and where their body mass index (BMI) was recorded, 26% were obese with a BMI over 30, while 22% of those whose child died in the neonatal period were also obese. 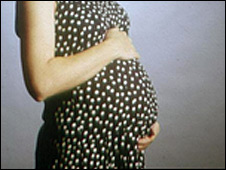 Mothers living in the most deprived areas of England, Wales and Northern Ireland, had stillbirth and neonatal death rates that were 1.7 times higher than those in the least deprived area. Black women were more than twice as likely to suffer stillbirth or have their baby die in the first week or month of life. Asian women also had around twice the risk of their baby dying when compared with white women. Jo Modder, CEMACH's clinical director for obstetrics, said the reason stillbirth numbers have not declined is probably down to a combination of factors. She said: "Health services are improving and there are greater advances in neonatal care, however these are happening against the background of a changing population. "People are getting fatter and there is also an increase in the number of people from ethnic minorities. It is well recognised that people from these groups have maternal conditions like diabetes which are known to be linked to stillbirth." Professor Sabaratnam Arulkumaran, president of the Royal College of Obstetricians and Gynaecologists (RCOG), said: "The death of a baby is a tragic occasion for all involved - parents, relatives and equally for healthcare professionals. "The RCOG supports good research that examines why these deaths occur and would like to see increased investment in midwifery and senior consultant staffing to help improve outcomes for mothers and their babies." Jane Brewin, chief executive for Tommy's, the baby charity, said: "These new figures confirm that more research is desperately needed into finding the causes of stillbirth, so that more babies lives can be saved through developing preventative measures. "Obesity in pregnancy is a significant problem in this country and has massive implications for both mother and baby. It carries an increased risk of major pregnancy complications including miscarriage, pre-term birth and stillbirth." She said Tommy's has just opened a pioneering new research centre focusing jointly on the causes and consequences of obesity in pregnancy. CEMACH - which carries out research to improve the health of mothers, babies and children - is running a national research programme into obesity.